Royal Dutch Shell's shares have recovered as oil prices have once again climbed. 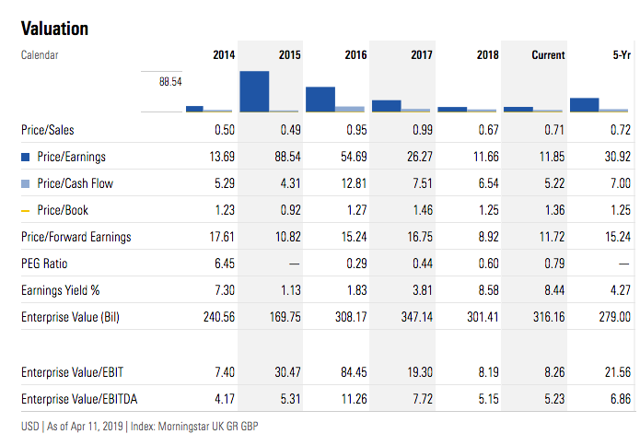 Shares offer an attractive yield and the company has not cut its dividend since World War II. The company is paying down debt and investing in the future for a positive path forward. Royal Dutch Shell (RDS.B) (NYSE:RDS.A) has been called the stock for orphans and widows. The reason being that the company has reliably paid a dividend for over 70 years. Investors looking for a way to have energy exposure while collecting a yield to provide income would be wise to add during a pullback. 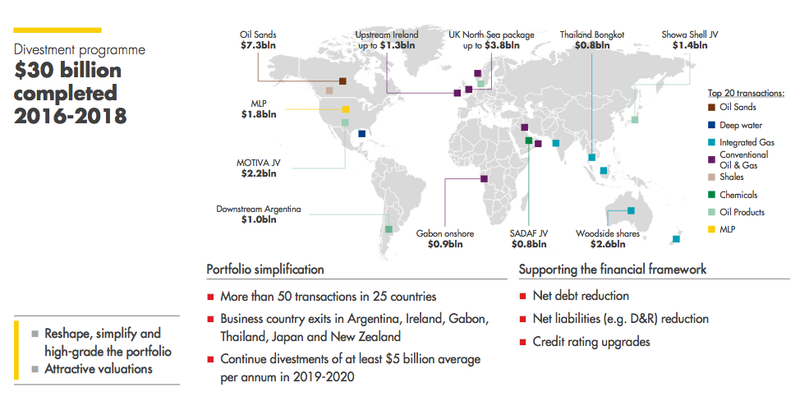 While there is no telling where oil will fall to in the latest bout, it tends to always bounce back, offering investors the chance to load up on well-managed oil companies for cheap. 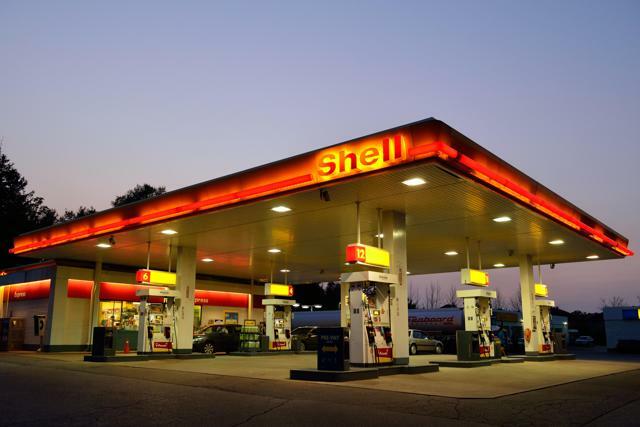 Not too long ago I decided to add shares of Royal Dutch Shell as I believed they offered an enticing yield and an enticing way to play the ever growing need for oil. While fears of electric vehicles taking over the world are rising, investors should not fear as there are is no immediate threat and Shell can invest in green energy as needed. 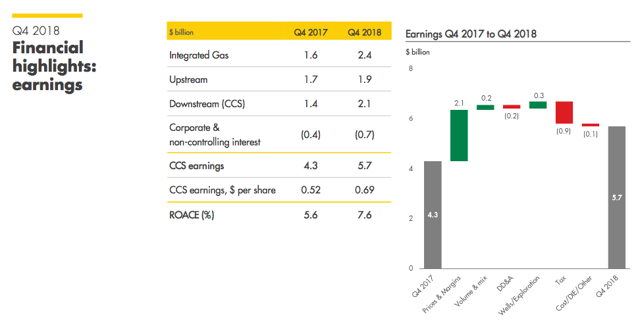 In the most recent quarter, Shell reported GAAP earnings of $0.70 per share which slightly missed estimates. On the top line, revenue came in at over $100 billion for the quarter and beat by a pretty large margin of over $7 billion. Revenue was of course helped by higher realized prices for natural gas and other liquids. Also, the company managed to increase production by 1%. This helped net income rise to almost $5.6 billion from the year earlier period of $3.8 billion. 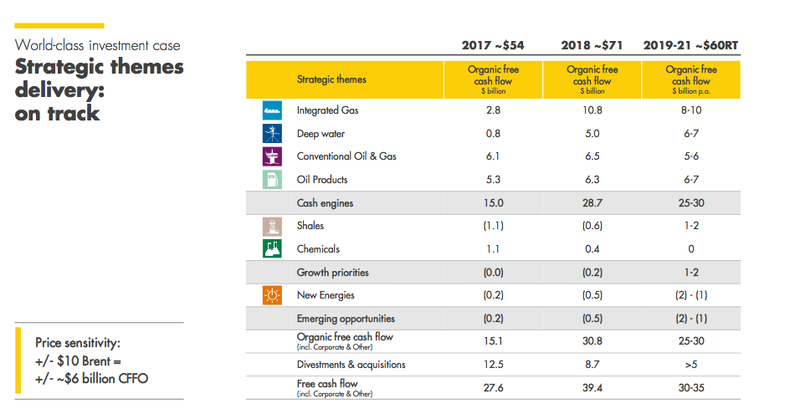 As long as oil prices remain high, Shell will continue to produce stronger earnings from its upstream segment. Revenue can jump around quite easily when you are producing millions of barrels of oil in any given quarter, so the more important figures to watch are cash flow and net income. Presuming the company can continue to further reduce debt, operational costs, and bring online more projects, then net income should be able to rise and become more stable despite lower oil prices. A snapshot below shows us some important and notable metrics for the quarter. The company had impeccably strong free cash flow of $16.7 billion for the quarter. For the full year, the company managed to generate $49.6 billion in free cash. Cash flow was positively used to return capital to shareholders in a number of ways. With debt reduction ongoing, the company now stands with $76.7 billion in debt. This compares to about $85 billion a year earlier. The company also has $26.7 billion in cash for a net debt position of $50 billion. I expect further debt reduction in the coming quarters as management continues to divest assets and drive cash flow higher. I find this debt level to be more than manageable for a company with close to $50 billion in free cash flow yearly. As noted above, the company is getting better at producing cash flow as it was able to produce the same cash flow at an average of $75 per barrel of oil as it did in 2008 with $120 per barrel oil prices. Investors should feel confident going forward that even with lower oil prices the company can maintain a sizeable stream of cash flow for continued investments and capital returns. Below we can see what segments contributed to the earnings growth we saw for the quarter. As we can see, oil and gas contributed a significant portion of earnings, but downstream did as well, which will continue to do well in a cheaper oil environment, providing support to the other divisions when necessary. By the end of the year, the company completed $30 billion in divestment of assets which helped reduce debt. After the $70 billion acquisition of BG, the company had plenty of assets that did not fit its long-term vision. This allowed it to keep the assets it wanted while making up for the high cost of the purchase price. The new company will continue to invest in projects that will generate substantially stronger cash flows in the coming years. Furthermore, the company can be expected to start delivering further returns as it invests $15 billion into new projects by the end of 2020. All of this will help increase earnings from each division moving forward. Investors should also be happy to hear this is with oil at an estimated $60 per barrel. While currently oil is near $50 per barrel, I expect this rout to turn around and come back to an average of $60-65 as many of the producing nations are not economically profitable until at least this price or higher. Because of this we can soon expect to once again see production cuts. The quick run up to $75 per barrel led many producers to start pumping more than needed for demand and once again flooded the market. Lastly, the company is continuing to allocate cash in a responsible and attractive manner. With the expanded cash flow coming online in the coming quarters and years, investors can expect even further capital returns and debt reduction. As Shell strengthens its balance sheet, the company can be expected to increase dividends and further reduce shares. As we have already seen, the company is committed to repurchasing $25 billion worth of shares by 2020.They repurchased $4.5 billion worth of shares for the year. The company is also approved to repurchase an additional $2.5 billion worth of shares by the end of January 2019. With the recent drop in share price, they will be able to instantly gain a return on investment of over 6% based on dividend yield alone. This is a great use of capital and should result in not only a higher share price but also a reduced capital spend on dividends. Down the road this will make the savings free for dividend raises along with further share repurchases and capital investments. The story is very enticing as within a few years shares should start to see the benefit from the increased capital position and returns. So now that we know the company is of sound footing and offers plenty of prospects going forward. 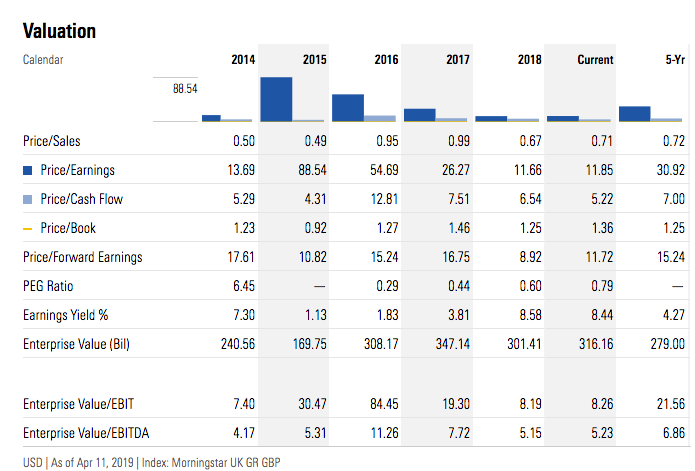 We take a look to see what the valuation picture looks like. First, we compare Shell to peers, specifically B class shares which trade at a slight premium to class A shares but have no withholding tax on the dividend. We see that Shell trades at a lower forward P/E versus every peer. Additionally, Shell has the highest yield in its group. 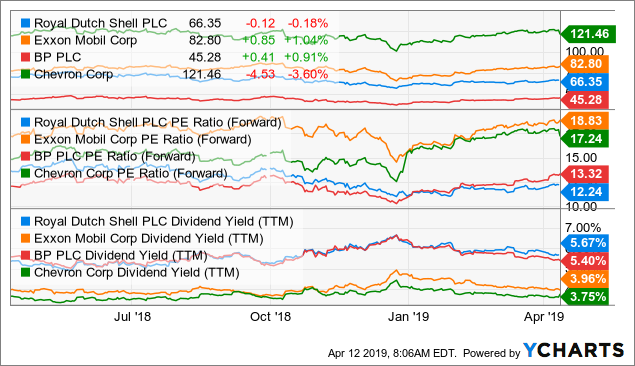 While BP (NYSE:BP) recently raised its dividend and Exxon Mobil (XOM) is a serial dividend raiser, we still have quite the gap in yield. BP currently yielding 5.67% is pretty close and worth consideration; however, its dividend history is not quite as strong as Shell's either. Next we look at valuation versus its own history for the past 5 years. As we can see, the company currently offers a lower forward P/E than its 5-year average as well as a lower P/CF and close to low P/B ratio. Investors are also able to get almost double the earnings yield it has offered in the last few years. This should all be seen as a positive and an attractive entry point for new shareholders. While there is the potential for further downward pressure on the stock, now would look like an ideal time to own some shares. Investors can expect a future growing dividend to further increase the yield on cost and make a current investment all the more appealing. It should be noted that dividends cost the company $3.8 billion in the most recent quarter, which was well covered by free cash flow. Additionally, the company will see increasing coverage as shares are continued to be repurchased. 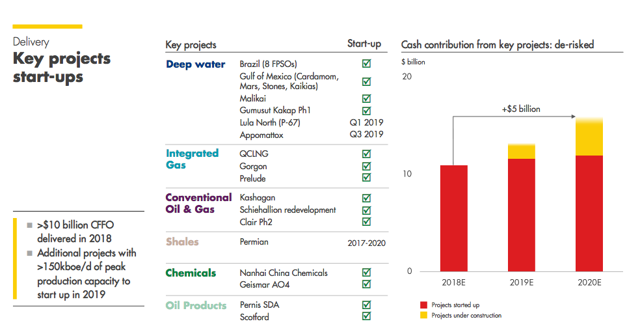 Based on current valuation metrics, we can see now may be an ideal time for investors looking for exposure to the energy space to begin a position in Royal Dutch Shell. For investors with existing positions, now may be a good time to add more. Royal Dutch Shell has been a reliable energy company offering reliable dividends for well over 70 years. Investors who like income and like having broad exposure should look at starting a position in Shell. While shares trade low compared to its historical average, the time to enter may be now. I have decided to start a position at $63 and added most recently at $60.85. I am looking forward to the added dividend income in my portfolio and would expect shares to recover to the high $60s with a turnaround in oil prices. I predicted that should oil make its way back to $65 per barrel, I would expect Shell to return at least 10% not including dividends, and so far this has happened. I believe this will be a good long-term holding for the next few years as the company continues to improve its balance sheet and add cash flow positive operations to its empire. With further divestments and reduction in debt, the company will be in an even better position to further withstand and take advantage of future oil cycles. The key is to remember oil is always fluctuating in price and taking advantage of the downward trend is always beneficial. While finding a bottom is always hard to time, as long as the valuation seems right as it does in this case, investors can expect positive returns. Disclosure: I am/we are long RDS.B. I wrote this article myself, and it expresses my own opinions. I am not receiving compensation for it (other than from Seeking Alpha). I have no business relationship with any company whose stock is mentioned in this article.